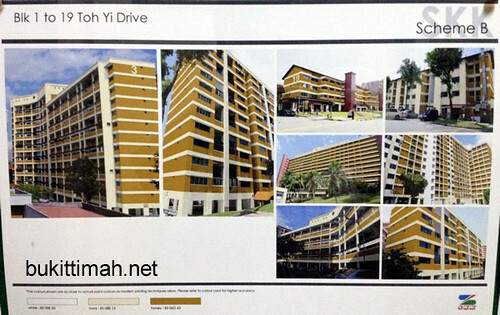 If you are living in the ‘now quite famous’ Toh Yi Drive HDB flats you would have received a form to vote for the colour of the blocks. These blocks are very prominent because they are tall and long. If you are along Jalan Jurong Kechil or Upper Bukit Timah Road, you can see them quite clearly. 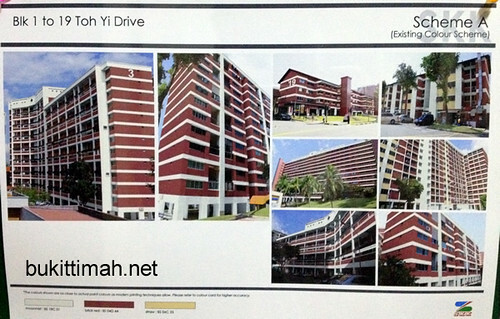 The all familiar red blocks might change colours if residents there want it to be. Let’s see what the residents vote for. Just like most things in Singapore, the colours might already have been ‘decided’ but the residents voting exercise is just some ‘wayang’. You know this because flyers and notifications arrived at the door steps the same day something in announced in the news! These photos were taken from the notice boards at the blocks. The current colour, Scheme A. A colour most are used to for some time now. 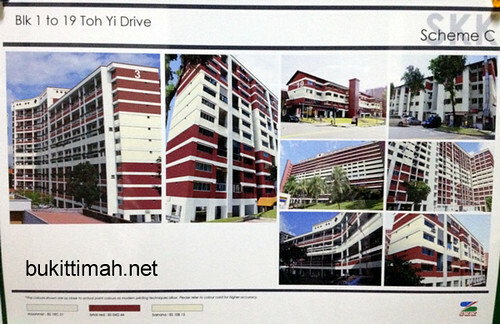 Scheme B is colour almost similar to the original Toh Yi Estate. If you walk around the estate, the steps used to be this colour, but it has recently been covered after upgrading of the steps to make it more non-slip. If you look around, for example the ‘rubbish collection area’ just in front of the Multi Storey Carpark, the colours of the bricks are still this shade of yellow. Scheme C doesn’t look too pleasing. You ask the kids around, they like it though!